Lion Island - Elliot Island - 2014 - A J Guesdon picture. A TRIP TO BROKEN BAY. After much preparation, consultation, and advice-asking, I entrusted my invaluable self to the custody of two friends. One, though young in years, was ancient in boating experience, and deeply skilled in all the lore of yacht management. The other was much more skilled than myself, though far behind our mentor. We dropped our moorings on Tuesday morning at 11, and with a fine whole sail southerly ran down the harbour. After clearing North Head, the wind appearing to freshen, we put back in under South Head and took in a reef. Now for the first time — my ancient friend had given utterance to much plain English did I learn that what he contemptuously termed a granny’s knot varied in its construction from a reef knot, though in what respect they differ I am still at a loss to understand. Having got down our reef, we again stood out, and after rounding North Head the voyage commenced in earnest. The boat was heading straight for her destination, so I headed for mine down below. To be sure I did not feel at all sick, but judged it prudent not to expose myself to the sea-breeze, as it never agrees with me until I have spent at least a week in my cabin. I was not long allowed to enjoy myself undisturbed, for a large flock of blackbirds appearing I was summoned on deck to give information concerning them; for although so bad a sailor I have been oft at sea. With as wise and non-seasick a look as I could I pronounced them to be stormy petrels, for as I looked -I beheld a tumbling southerly sea. I retired. I was again called, this time to enjoy the scenery. I loosed upon the other side, but then again the southerly sea met my gaze, and I again retired, this time much comforted, for I was quite satisfied that my companions were seasick, though they denied the charge. When I was again summoned beautiful indeed was the scene, for the broad but placid waters of Broken Bay lay before me, Pittwater stretched away to the left, Brisbane Water to the right, in the front the Hawkesburyand Cowan Creek, the whole forming a picture of rare loveliness and grandeur: a picture which I have never seen equalled, except by those famous lakes far away amongst the Terry Hills and which I feel sure cannot be surpassed by many in the whole world. I shall not readily forget my first view of Broken Bay, as I beheld it by 'the light of the evening sun. I shall not forget the bluff faces of Mount Elliott and Barrenjuee, the bold headlands which succeeded each other in almost countless numbers along either side of theHawkesbury, the intricacy of points, islands, and pearly white beaches which form Brisbane Water; or the broad, open expanse of Pittwater, bounded on the one side by almost perpendicular hills, clothed from the base nearly to the top with almost tropical vegetation ; on the other by long beaches, jutting points, and small knolls, well grassed and timbered. 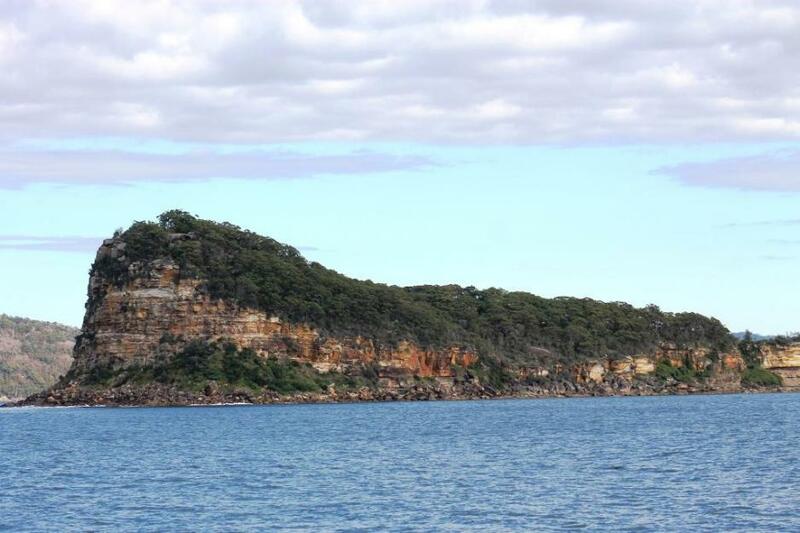 Our first camp was at the Basin, a small dock formed by a sand spit, extending almost across a narrow arm of Pittwater: this spit protects the basin from both wind and sea. Having secured our ship we exercised our various talents in the cooking line; our mentor shone equally at the pots as in the boat. He was deeply versed in the mystery of die cuisine. He roasted potatoes to a shade, but excelled chiefly in all the various forms of oatmeal preparation; our other man was fish-cleaner, and I washed-up. We spent the evening black breaming, but the sharks gave us no peace, often breaking our strongest tackle, to make no mention of innumerable black bream lines. 'We got one or two into the boat, which was so very small that we were obliged to get out, after sustaining, with heroic fortitude, the dangers of shipwreck and shark bites. Next morning, after breakfast, we hove up anchor, and with a fine southerly ran up Cowan Creek for a few hours. The views all the wav were beautiful and ever varying. We cast anchor off a point in the afternoon and in an hour we caught some dozens of tragglin. The sharks here were numerous. They afforded much exciting sport; in landing we materially aided by a small trident. I should recommend any person who intends fishing on a ground where they are likely to meet sharks, stingrays, or any other vermin, to own something of the sort. The land is so precipitous at Cowan that no level place could be found, except at the top of almost perpendicular hills. One of the party who was sent ashore to light a lire, and choose a camp, did ascend one of the hills I have described, carrying some, part of the culinary utensils. He lit a fire and sat down, but was speedily aroused by the ancient tyrant below calling him- all- the words in the dictionary, and commanding him to come down. He descended and was addressed by my name with several additions.- During this evening we had some very exciting sport off the yacht. It was near becoming more than a joke for our ancient mariner was several times nearly pulled overboard by same huge fish or fishes; our tackle was not sufficiently strong to hold any of them, though some of our lines would have done very well for the jib sheets. Early next morning we went to shoot wallabys, but after much labour we came to the conclusion that as there were none to shoot it would be folly to shoot them, so we got on board and ran down towards the Heads and back again to Flint and Steel, where we camped. Before tea we did seine fishing, and in an incredible short time caught enough bragglin to half fill the dingy. The sharks and stingrays here were legion ; they cost us more lines and hooks than would have sufficed for a month's ordinary fishing ; to such a pitch did the hook-taking process arrive at that when a man got a bite he was not offered another bait but another hook and the offer was generally accepted. As the roll from the Heads sadly interfered .with the peace of mind of one of the party, he slept ashore and passed a miserable night. So full of fearful dreams and ugly sights that ever afterwards he preferred the yacht's rolling to so lonely a position. Flint and Steel is a long shore, extending from West Head, which corresponds to our Middle Head, to the mouth of Cowan Creek. On Friday morning, with a good wind, we ran up the Hawkesbury past Dangar's Island, on which Mr. Dangar has planted an orchard and built a cottage. I suppose he uses it as a fishing station when he visits the bay, and several other islands, whose names I have forgotten. The scenery on both sides of the Hawkesbury is very beautiful; its arms are numerous, and all I saw were lovely. Islands abound, but so also do shoals. The latter caused us to bring our sail to a close sooner than we could wish; for fearing to run aground, we bore up into the wind and commenced our voyage down. We camped that night at the Basin, and on Saturday Pittwater occupied our attention. Having tried several grounds unsuccessfully, we caught sufficient fish for tea off West Head. A strong southerly wind which was blowing may account for, our non-success. On Monday, as there was a north-easterly wind for the first time since we left Sydney, we went fishing under the lee of Mount Elliott, an island at the entrance to Broken Bay ; here in an hour we caught about a dozen line schnapper, the small number of flatheads, seven sharks, and several odd fish. It was the fastest work I had ever had. As soon as we had got a fine haul we hove up anchor and stood to sea, and having made a good offing we turned our bows towards Sydney. After a line run of 8 hours 13 minutes we reached South Head. I was able this time to resist the efforts' of my briny enemy, and to take some part in the management of the ship. To any person having a spare week I should give this advice— Go to Broken Bay. If in a yacht take a skiff; if in a fishing boat, which I should recommend, on account of the shallowness of the water, a dingy will be useful. Don't let the party be less than three: five is about the best number; Don't start except with a fair wind; for although it is only about twelve or fifteen miles from Heads to Heads, a small boat will not travel at sea. Take a good chart, but no grog, as few luxuries as possible, as they do not agree with the sea; a rifle, but as there is very little to shoot one shot gun will only be necessary. We found oatmeal a good portable thing to take; preserved meat does very well as a change from fish, which can be caught anywhere. I can 'recommend' the Hamornie beef, but not the mutton. I only know one schnapper ground that I can recommend; the little beach off Mount Elliott, the outer end with a falling tide, and the inner end with the tide rising. But do not load the boat with anything but necessaries. Money may be useful, as opportunities of purchasing honey and fruit sometimes occur. Lastly, don't take a duffer.